Team USA cruised to a victory against the Swiss to stay in control of Group A heading into their final game of preliminary round play. Phoebe Stänz was named the Player of the Game for Switzerland, and Keller for the United States. Janine Alder remained in net all game for the Swiss and made 41 saves, despite the onslaught of goals from the American attack. Sweden desperately needed a win in this one to avoid relegation, and they got one in a nail-biter against the French. Escudero actually opened the scoring in the first, France’s best period of the game; they put up 10 shots on goal in the first 20 minutes and 10 for the rest of the game. 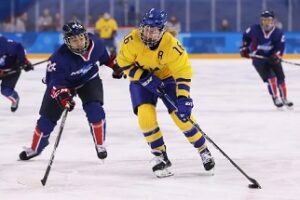 Sweden came storming back in the second, netting two goals to gain a 2-1 lead and outshooting the French, 15-4. Caroline Baldin turned in another great performance for Team France, stopping 38 shots to keep it a one-goal game.